In this tutorial we will show you how to convert ESD to WIM file using Command Prompt. 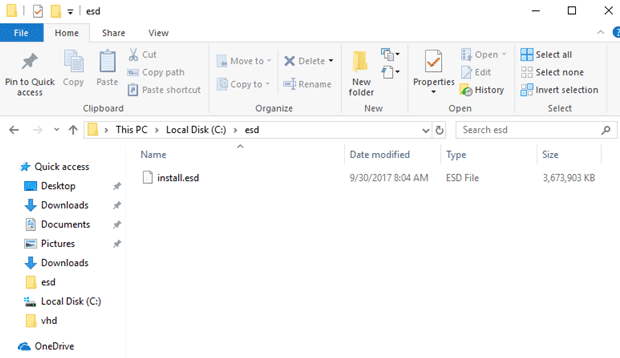 ESD file is a new thing within Windows 10 OS, that Microsoft is pushing out. ESD (Electronic Software Download) files used when installing software upgrades, they are not to be opened manually (unless you’re converting them). Instead, Windows uses them internally during the update process. The problem is that a lot of users using WDS to push out their images. So today we will show you can easily convert ESD to WIM image. First of all, we’ll figure out what the install.wim and install.esd files are and how they differ. Install.esd and install.wim are archives containing compressed operating system files, and they can include several Windows editions (Professional, Home, Enterprise etc.). During the installation of Windows, all files are unpacked from the install.wim/esd image to the system drive of the computer. If you compare the size of the analog files wim and esd, you can notice that the file size with the esd extension is smaller, because it is compressed more strongly (a new type of compression is used – Recovery). This compression type packs the Windows installation files even more and, as a result, the size of the install.esd file becomes less than the install.wim file by 30%. Microsoft distributes the last upgrades of Windows 10 builds in the install.esd format. 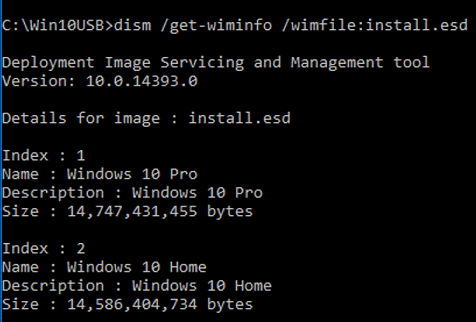 In addition, recently in all distributions of Windows 8.1, Windows 10, instead of the install.wim file, install.esd is located. The inconvenience of using the install.esd file is that Dism refuses to mount this image. Accordingly, in such image it is impossible to inject drivers and updates. Therefore, in this situation, the easiest way is to convert the install.esd file into install.wim and then just work with the install.wim file. The first thing you need to do is to open your File Explorer. Go to C: drive and create a folder Win10 and drop all files from Windows 10 ISO image into it. When you copied all files, go to Sources, find install.esd and make a copy of this file. Now create another folder on your C: drive – name it ESD. Paste install.esd file into this folder. 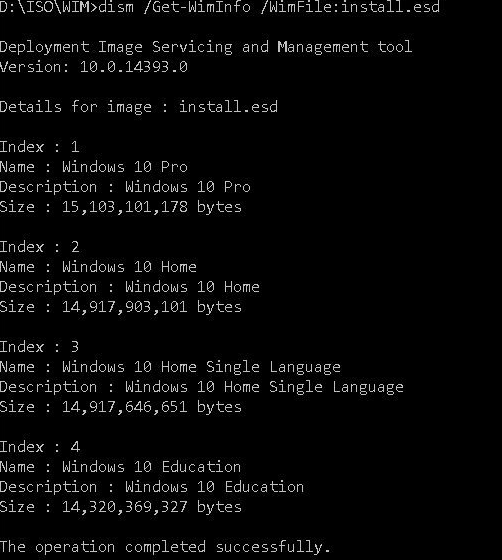 As you can see, in the install.esd archive there is an image of 4 versions of Windows 10 with the indexes: 1, 2, 3, 4. Find index number that you need (we are choosing Index 1 because it is a PRO version). Image exporting is started and this process can take a long time. Conversion is quite a resource-intensive operation, during which the processor and memory of your computer will be heavily loaded. 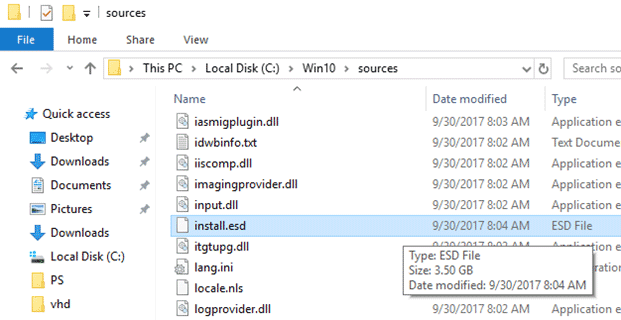 Once ESD conversion is completed, you can copy your new WIM image file and then go to Win10 original folder, then to Sources and replace install.esd file. The resulting install.wim file can be mounted by the DISM utility, and you can use it to create your own Windows assemblies. That’s it! Hope this was useful for you! thank you so helpful my windows 10 didnt have the wim file so this was great!! Thanks, you helped a lot! I’m not sure about the x86 version but sure about x64 . Thanks Andrius for the x86 information. 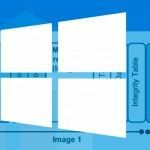 you can user NTlite (Non -commercial and commercial versions are available) tool for completely modifying your Windows 10 Image. 2017-01-27 19:52:49, Info DISM DISM.EXE: Succesfully registered commands for the provider: WimManager. 2017-01-27 19:52:49, Info DISM DISM.EXE: Succesfully registered commands for the provider: GenericImagingManager. 2017-01-27 19:52:49, Info DISM DISM.EXE: Succesfully registered commands for the provider: Compatibility Manager. [0x80070057] ReadWriteDataInternal:(142): De parameter is onjuist. [0x80070057] ParseChunkRegionInternal:(1211): De parameter is onjuist. [0x80070057] ResNodesLoad:(790): De parameter is onjuist. 2017-01-27 19:52:57, Info DISM DISM.EXE: Image session has been closed. Reboot required=no. You have encrypted ESD the author of this post has decrypted ESD. Author of this post doesn’t seem to understand what is ESD and his ESD file has been decrypted with scripts that are not officially publicly available. if a .esd file contains 2 images (index 1 and index 2), how can I make a .wim file that contains both images? The commands you show only extract one image. Is there a way to simply convert the .esd to .wim (even if it contains 6 images)? Just run the command again, but switch the index number. It appends the .wim rather than overwriting it. Is it possible to convert the opposite way, from WIM to ESD file? And, if so, would you happen to have any information on how to perform this action? I think I found a new god, It was not possible to work with the Deployment workbench for windows 10 with a install.esd file. I needed to convert to it to install.wim for the WDS server. Where exactly IS this “Windows 10 ISO image”?